The press conference discussed the results of the broadcast of the 2018 FIFA World Cup in Uzbekistan. A press conference on the theme "2018 World Cup: the game of millions, live broadcast and football joy" was held in Tashkent on July 16. It was organized by the News Agency UzReport (TV channels UZREPORT TV and FUTBOL TV) jointly with the International Press Club. It was attended by referee Ravshan Irmatov, Russian commentators Denis Kazansky and Alexander Elagin, leading commentators of UZREPORT TV and FUTBOL TV, as well as media representatives. Noteworthy that UZREPORT TV channel has made great efforts to acquire the rights to organize the legal broadcast of the 2018 World Cup matches. UzReport has made a number of technical improvements, including the introduction of broadcast channels in high definition (Full HD). An additional advantage was the bilingual audio track and the ability to choose the language of commenting on your own. Leading Russian sports stars Denis Kazansky and Alexander Elagin, as well as well-known Kazakh commentators - Dmitry Mostovoy and Yevgeni Akmanov were involved to comment the matches. 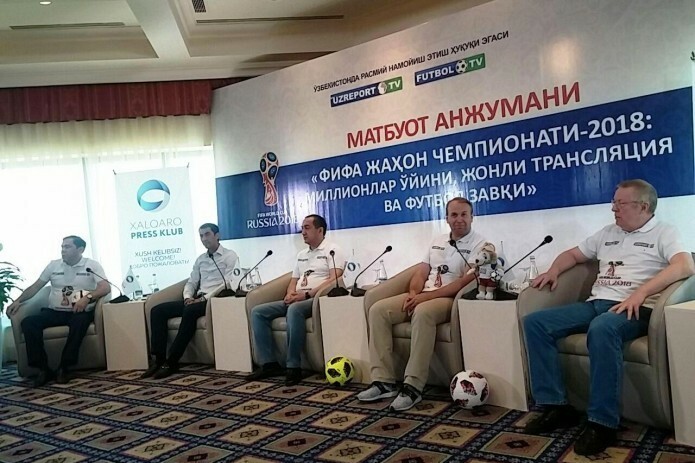 Russian commentators, in order to promote football in Uzbekistan, held a number of meetings with representatives of football fans and gave several interviews to journalists.